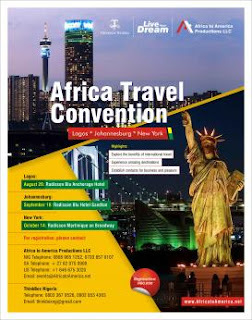 From August to October 2017, the Africa Travel Convention will be held in Lagos (Nigeria), Johannesburg (South Africa) and New York (USA). This is a series of events to develop the travel lifestyle of Africans and explore international opportunities. Registration Registration shall be secured with a nonrefundable fee of N60,000 per person. The fee shall cover a Seminar at each location, Visa Application Assistance and City Tour in Johannesburg and New York. Participants are to cover their travel and accommodation arrangements but we may assist in securing discounted rates for those who require them. Additionally, visa applicants will pay the required visa fee. Visa Processing Registered participants who require travel visas for this purpose shall be assisted. Letters of Invitation shall be provided and the visas can be applied for in Lagos or Abuja.